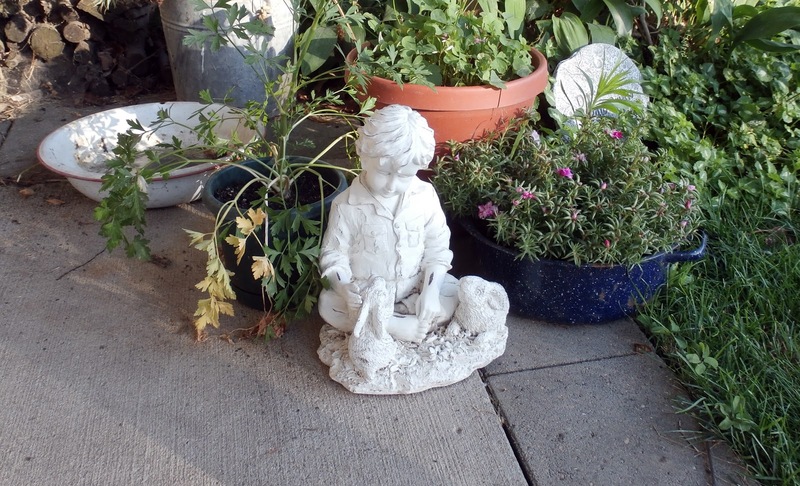 On the downstairs patio, sits a sculpture that really shouldn't be outside. During the moving process things were taken down the hill outside and left at the sliding glass door. I had the guy with his rabbits sitting on the patio table for a while. While watering all of this, yesterday, I realized that I should get the guy and his rabbits moved inside soon. The granite enamelware water basin in the background came from an old house where my Grandmother Brooks lived. When she moved out, back in the sixties, to a house with running water, she left the basin behind. About 25 years later when my wife and me stopped in to see the deteriorating house, the basin still sat in the dry sink just as my grandmother had left it. Most of the floors were rotted away so it was a challenge to get to it. She had water that would be pumped by an electric pump from a well. It would come into the back porch. She would carry all of the water that they used, including drinking, in from the porch. We washed our hands in that basin when visiting and sometime she washed small amounts of dishes in it. 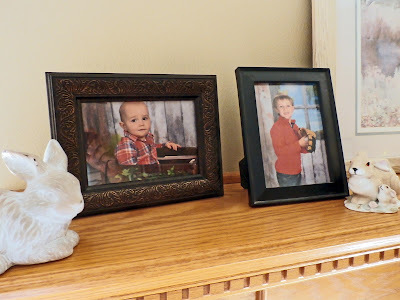 Newly displayed photos of the grand boys sit on the mantel. The youngest one is almost walking. He has this walking devise that we gave him at Christmas and he now uses it like a modern walker, running and slamming into things as he goes. His dad says he can stand in one position for a while but still likes to hang on to things. They both have grown and changed so much this past year. The continuous report on the progress of my zinnias and sunflowers continues. 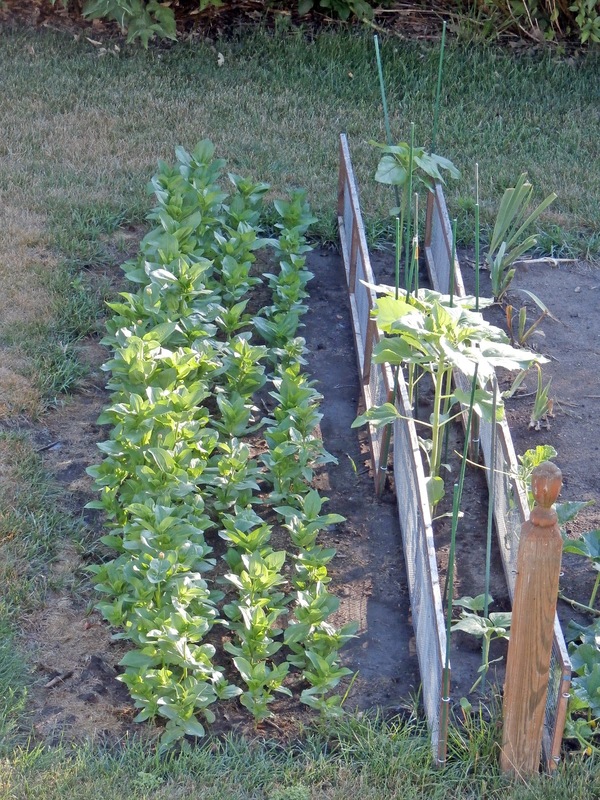 All things were planted too late but the first row has started to set buds for flowers. The sunflowers survived and escaped being snapped off but the birds but I still may have a gap in the row. Maybe that will make it look more natural. People who raise sunflowers in Iowa for bird seed are in full bloom already. I did see yesterday cornfields in Iowa with tassels and small corn starts with silks. The corn is growing well at our old place. First coat of varithane is on the unit. I like how varnish brings out the markings in the wood. When it is wet it makes things look three dimensional. I will be adding at least one more coat to it. I plan to buy a clamp to fix two hanging chads on the piece. I will explain that all later about the trials of a 14 year old putting this together. I have the planting of a couple of day lilies to get done today and some spot mowing to do. In a drought, it really isn't necessary to mow unless you want to cut down the few stray tall sprouts of grass. I think I will also move some flag iris from the temporary garden to a corner garden. It is full of asparagus and no real flowers. If the lilies and flag iris crowd it out, I won't be sad. I do like eating asparagus but its foliage really is not a flowering foliage to look at for the entire summer. We have errands to run and will be in and out all day. I wish you all to have a good day today. Thanks for checking in on me. Yes, grandchildren do seem to grow up very quickly, Larry, as we well know. It's hard to believe that your youngest granddaughter is already 7 months old and that the other granddaughter will be 6 next weekend. Glad to see the progress on the bookcase. Interesting story about the washbasin. I love the new photos of your grandsons. They are handsome fellows. 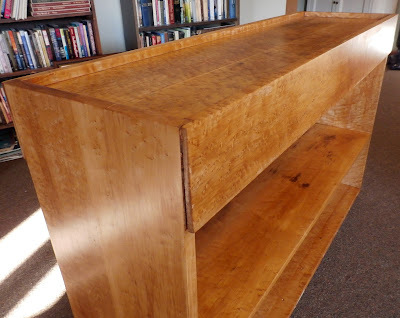 I also love the way your shelf has turned out. Very nice wood. The heat has us moving slowly today! Sounds like you're keeping busy. We sure are! I am trying to catch up on blogs since I've been away from blogging for awhile. I see you're all moved in to your new home and working on projects !I think your enamel basin is a treasure and the history around it makes it even more so.